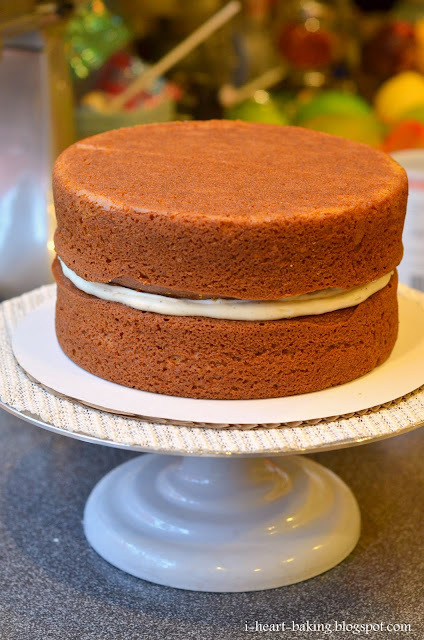 My cousin Yvonne's birthday was on Thanksgiving Day this year, and since the two of us are known to devour an entire pumpkin pie together, I decided to bake her a pumpkin spice layer cake. I used a recipe from Martha Stewart's "Cupcakes" book, except instead of making cupcakes I made two 8-inch round cakes. While the cakes were cooling, I started on the filling and the frosting. I knew that I wanted to make brown butter cream cheese frosting (when I made that combination for my Halloween cupcakes, the flavors combined were delicious! ), but I wanted the filling to be a bit lighter, since my family doesn't like desserts that are too sweet. So I whipped up some fresh whipped cream, and then added about a cup or so of the brown butter cream cheese frosting to it, to make a lighter filling with the same flavors. Once my cake was filled and stacked, I let it set in the fridge so that I could add color to my remaining frosting. I was going for a peachy-pinky color, so I mixed pink with orange and a bit of yellow. Once that was ready, I applied my crumb coat of frosting (this is to seal the cake and to prevent any cake crumbs from ruining the finished frosting). Since the first roses cake I made was so popular (inspired from the rose cake tutorial by I Am Baker), I decided to decorate this cake the same way. 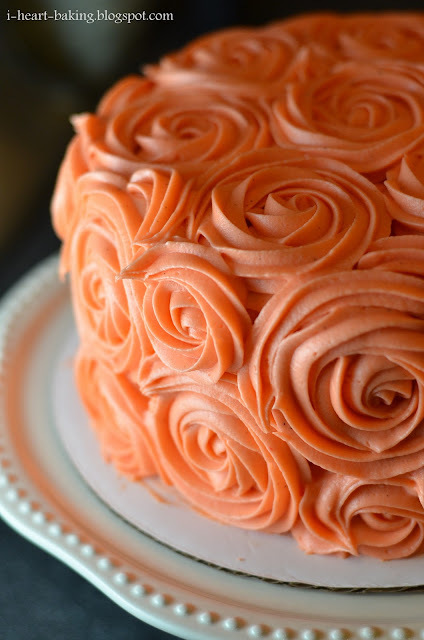 Using a 1M Wilton tip, I piped large roses all over the cake, and filled in the remaining spaces with swoops and swirls. 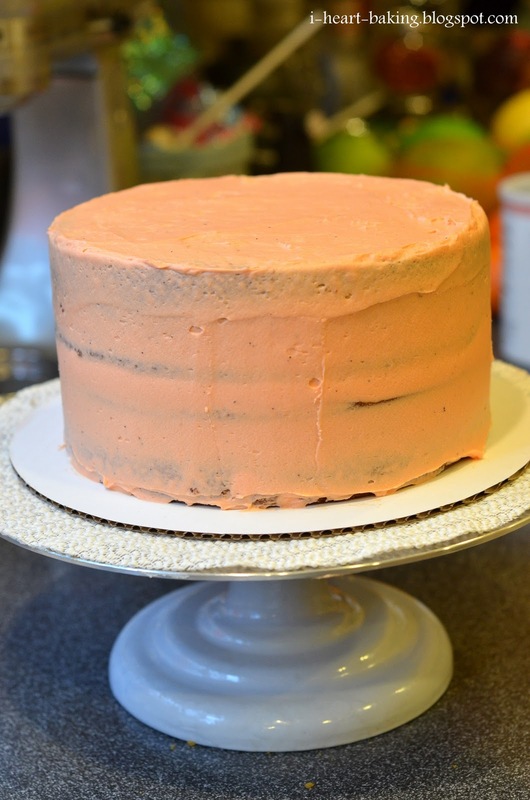 I loved the way the specks (from the browned butter) in the frosting showed through the peachy color of the frosting. Although, while my frosting started out to be the perfect peachy color, after a few hours the color set and turned into more of a bright orange sherbet color! It wasn't what I was originally going for, but it actually worked out to match the whole Thanksgiving theme of the cake. 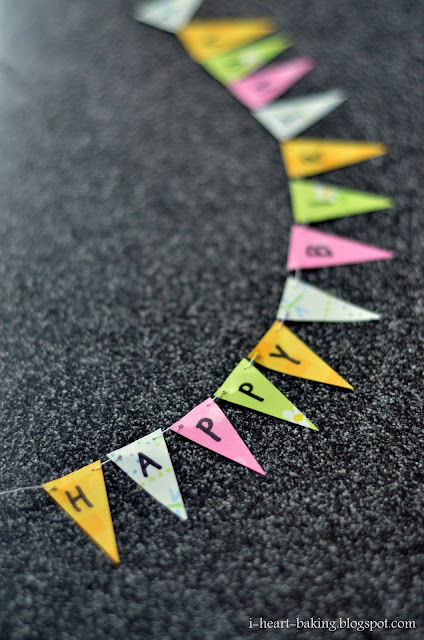 The final touch was a homemade birthday banner for the cake, similar to the one I made for my son's Superman birthday cake. I took differently patterned craft paper and cut small triangles out of them, then threaded them together with string and a sewing needle, and then wrote "HAPPY BIRTHDAY" on them. Then I attached the two ends of the banner to bamboo skewers ... 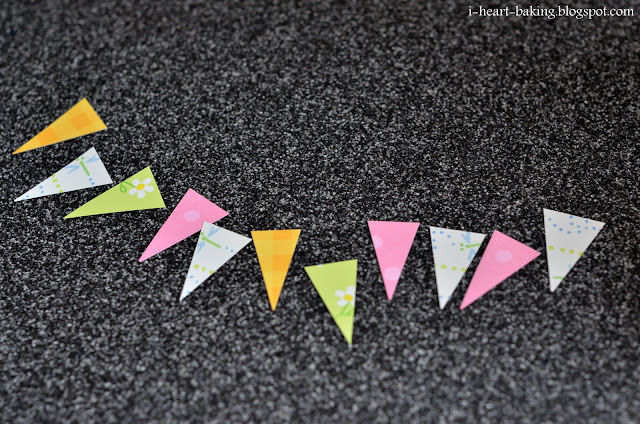 I attached double-sided tape on the skewers, wound the string around the sticky part of the skewer, and finally tied the string securely in a few knots. It was the perfect combination of Thanksgiving flavors, birthday cake look-and-feel, and girliness with the roses and patterned banner. Hope you enjoyed it, Yvonne! Happy Birthday!!! This is such a pretty cake and the perfect flavor for a thanksgiving birthday! Nice job! A gorgeous cake! 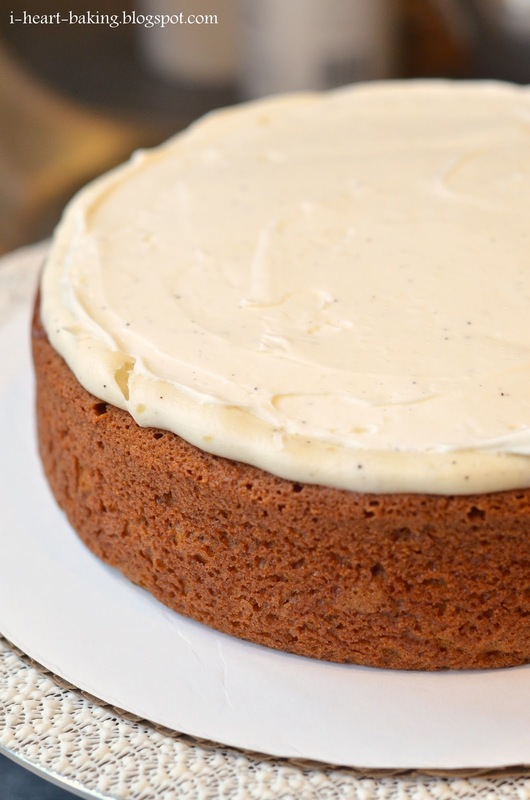 I make Martha's pumpkin spice cake often, it is one of my favourite cake recipes!! just fabulous! Love the roses! You are a super cake maker! This looks incredible! And it not only looks good, you can tell by the recipe that it TASTES good too :) Buzzed! This has got to be the best frosted cake i've ever seen! Super beautiful!!!!!!!!!!!! I hope your cousin enjoyed it. It looks divine. That is the most gorgeous frosting I've ever seen! Really gorgeous! Fabulous looking icing! your cake layers came out beautifully. the roses are lovely. it sounds delish too! Beautiful doesn't even begin to describe that cake. If it tasted half as good as it looks, it was probably devoured in a matter of minutes. Great job. Congratulations, I´ll try roses, they look lovely. What a lovely cake, I love how the roses looks on it, some day I have to try to make something like that. you stole this technique from i am baker,the least you can do is tell people that. She did mention that, its not stealing the book tells you how to do it. @Amber - Sorry if it wasn't clear, I linked to my first post where I tried the roses icing where I mention I Am Baker's method. 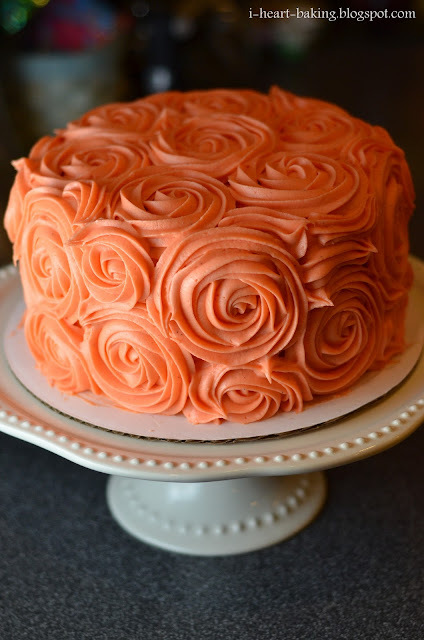 For those of you who don't know, here is I Am Baker's rose cake tutorial. Aww...I love the color! You are just getting better and better with the roses! You should make this cake in a rainbow of colors =). This is so beautiful! I love the orange! I love the roses, I love the color... I love your cake! This is one of the prettiest of these types of cakes I've seen! The color is beautiful, too!! But I dont know if this is right or not:( Can you tell me yours? Thanks!! I think it looks AMAZING, first attempt or not! Thanks so much for sharing this technique. Really, you did a fantastic job! @Jessica Mador - thank you! you're so sweet!